Entries Close Saturday, September 15, 2018. No Post Entries Accepted. 1. All entries must be free from any evidence of infectious or transmissible disease. Final decision of health of entries will be determined by the committee members. Animals that are sick, under 12 weeks of age or small enough to fit through cages will not be accepted. all entries must be owned by their exhibitors. 2. Entries must be received on or before Sept.15th. Entries close Sept. 15th or when cages are full. 3. Rabbits will be shown in 2 classes. An ARBA class for purebred animals with a permanent ear tatoo, and a pet class for Junior exhibitors whose animals are not purebred or do not have an ear tattoo. 4. ENTRY FEE: An entry fee of 50¢ per rabbit must accompany the entry form. There is no fee for guinea pigs and small mammals as exhibitors must provide their own cage, food, dishes and blanket or towel for night covering. No habitrails accepted. 5. CLASSES: All entries must be identified by class, breed, and variety. Classes of rabbits will be: Sr. Buck and Sr. Doe, for rabbits 6 months and over; Jr. Buck and Jr. Doe for rabbits under 6 months; and 6-8 month Buck and 6-8 month Doe (for breeds over 10 lbs at maturity). 6. Entries in the ARBA show will be in the open class. No Entry changes allowed. 7. 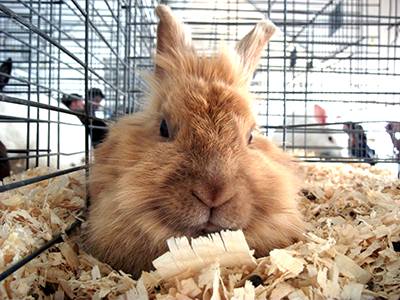 Feed, water and bedding will be provided for rabbit entries, but not for small mammal entries. Appropriately sized heavy, weighted feed and water dishes must be supplied by the exhibitor or the entry will NOT be accepted. Cans or light dishes will not be accepted. 8. MAXIMUM ENTRIES: Maximum entries per exhibitor for each division shall be: 25 rabbits and no more than 10 pet rabbits, 3 for small mammals. No more than 3 of any variety of guinea pigs per exhibitor. 9. JUDGING: Purebred rabbits will be judged by the American Rabbit Breeders Standard of Perfection. Pets will be judged on the Danish System. Guinea Pigs with ear tags will be judged under the ARBA system. 10. Entries must be in place Thursday, Sept. 20 th and will be accepted from 5:00 pm until 8:00 pm. All entries must remain in place until 6:00 pm on Sunday. 11. ARBA judging will be held on Friday, September 21st at 7:00pm., or at the convenience of the judge. 12. If exhibitors wish to sell stock, they must be present at the time of the sale and make the necessary arrangements with the purchaser for removal at the PROPER TIME. No stock may be removed before Sunday at 6:00pm. Only animals entered may be sold. Signs shall be no larger than 3”X5”. NO OTHER ANIMALS FOR SALE WILL BE ALLOWED.